March Madness is here. The 2019 NCAA tournament tipped off Tuesday night, with Fairleigh Dickinson and Belmont getting their first-ever tourney wins. But there’s still time. Tourney Pick ‘Em brackets don’t lock until Thursday. So Yahoo Sports convened a small panel of experts to answer four pressing bracket questions — and to help steer you toward the top of your pool. Which No. 1 seed will lose first, and why? Jeff Eisenberg: Gonzaga is my choice, not because the Zags aren’t worthy of a No. 1 seed or talented enough to reach the Final Four. They simply have the most treacherous draw of any No. 1 seed, one potentially laden with unfavorable matchups. Eighth-seeded Syracuse has won three or more NCAA tournament games in four of its last five appearances, the last two as a double-digit seed. Fourth-seeded Florida State convincingly eliminated Gonzaga in the Sweet 16 last March, and is the type of physically imposing team that traditionally gives the Zags problems. Jason Owens: Gonzaga. This isn’t so much a knock on the Zags as it is a nod to the strength of the ACC’s No. 1 seeds, which are the best teams in their respective regions. The Zags do have the best win of the season with a victory over full-strength Duke in Maui. But the other two times they faced elite competition, they lost to North Carolina and Tennessee. And that ugly 60-47 loss to St. Mary’s in the WCC final is cause for more concern than it’s received. Henry Bushnell: The Zags. But, as Jeff said, not because they’re fraudulent or overrated. Because their probable second-round matchup is with a coach who’s 15-2 in first-week tourney games since 2006, and their probable Sweet 16 matchup is with a better version of the team that bounced them at the same stage last year. Which double-digit-seeded mid-major is most likely to make the Sweet 16? Jeff Eisenberg: The one I’d strongly consider is Northeastern. 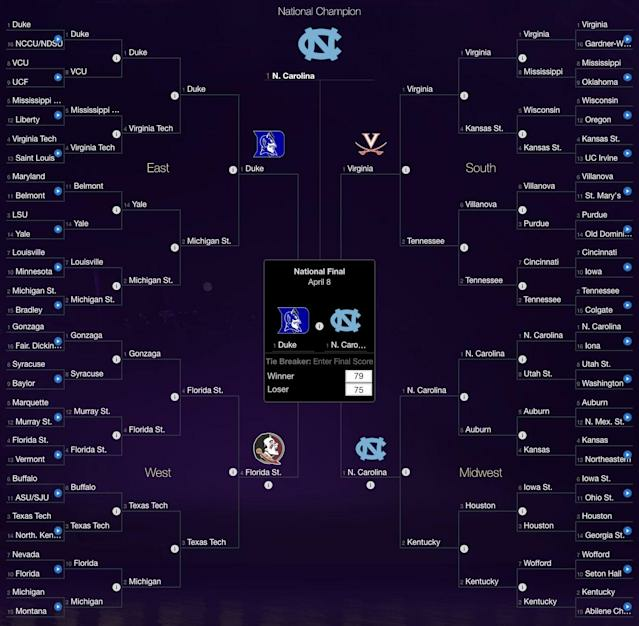 It has a favorable first-round matchup in a section of the bracket where winning two games is not out of the question. A four-guard team with an outstanding point guard and 3-point shooters galore, Northeastern has a chance to exploit Kansas’ leaky ball-screen defense. The Huskies are also better than their 23-10 record suggests as the bulk of their losses came during an injury-plagued November and December. A likely second-round game with Auburn wouldn’t be easy for Northeastern, but you never know what you’ll get with Auburn. A team that streaky can be upset-prone. Henry Bushnell: Can’t tell you exactly who, but it’ll come from the Thursday afternoon games in Jacksonville – from the third four-team pod in the East region. Yale is not your typical 14-seed. Belmont is the strongest of the First Four. Each has a machine-like offense that manufactures good shots at the rim. And the Bruins are lethal from three. Meanwhile, Maryland and LSU are the weakest teams on their respective seed lines. That’s the most likely Chaos Pod, and an 11-vs.-14 Round of 32 matchup is a real possibility. Jason Owens: Murray State. The No. 12 seed Racers feature an NBA lottery pick in Ja Morant, OVC defensive player of the year Shaq Buchanan and 3-point threat Tevin Brown. They open the tournament against a Marquette team that’s lost five of six games. If you’re not picking the Racers in a 12-5 upset, you’re not doing it right. A likely second-round matchup against Florida State will be considerably tougher. The ‘Noles are legit. But they’ve also laid eggs this year against Pitt and Boston College. If that FSU team shows up against Murray State, the Racers have a chance at the second weekend. Which popular upset pick is misguided? Jason Owens: The other side of the 12-5 coin is Auburn-New Mexico State. The No. 12 seed Aggies enter the tournament on a remarkable 19-game winning streak after raising their national profile in December in a 63-60 loss to Kansas. They’re a good basketball team. They’re just not better than Auburn. The Tigers’ eight-game winning streak pales in terms of quantity, but the quality of that run is significantly higher. All of those wins came against SEC competition with two of them against No. 2 seed Tennessee. Auburn is not vulnerable here. Henry Bushnell: I understand the Liberty love. But just because Mississippi State is a relatively anonymous team whose name you haven’t seen on a bracket in a decade doesn’t mean it’s vulnerable. Ben Howland’s offense is really efficient and, more importantly, really well-rounded, not reliant on any one form of attack. I don’t see it. Jeff Eisenberg: Thirty-four percent of Yahoo users so far have picked 10th-seeded Iowa to oust seventh-seeded Cincinnati. What that means is that 34 percent of Yahoo users haven’t watched Iowa play lately. The Hawkeyes skidded across the finish line, dropping six of their final eight games including a home loss to Rutgers and a road loss at short-handed Nebraska. Over the last six weeks their wins have come against Northwestern, Rutgers, Indiana and Illinois, none of which are remotely as good as 28-win Cincinnati. Who’s the Final Four dark horse nobody is talking about? Jeff Eisenberg: The region with the best chance for a dark horse Final Four team to emerge is the West, which features a No. 1 seed with a tough draw, the weakest No. 2 seed and a bevy of experienced, talent-laden teams seeded No. 3 to No. 8. My pick from that region is fourth-seeded Florida State, but I wouldn’t be surprised to see Texas Tech emerge either. The Red Raiders boast an elite coach, a future lottery pick, a smothering defense and an offense that has improved as Jarrett Culver’s supporting cast has blossomed. Jason Owens: Texas Tech. The Red Raiders feature an NBA lottery pick and arguably the nation’s best defense. Culver is a rangy, lockdown defender on the wing who can shoot and fill up the box score. He’ll be the best player on the floor most nights. This is a team with the tools to take down blue-bloods. Henry Bushnell: Enough people are, or at least should be, talking about Florida State and Texas Tech. So let’s talk about Virginia Tech – also known as Duke’s toughest possible pre-Final Four matchup. The Hokies already beat the (Zion-less) Blue Devils, are getting senior point guard Justin Robinson back from injury, and take and make a ton of threes. Don’t just pencil in Zion! Jeff Eisenberg's Yahoo Tourney Pick 'Em bracket. 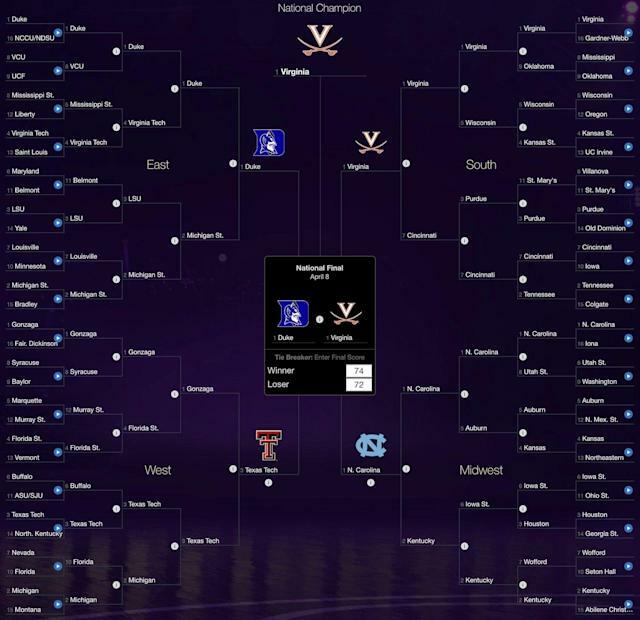 Henry Bushnell's Yahoo Tourney Pick 'Em bracket. 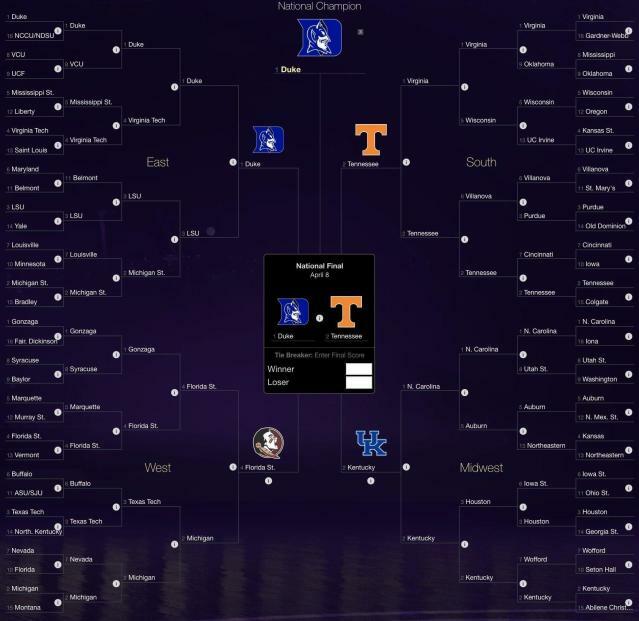 Jason Owens' Yahoo Tourney Pick 'Em bracket. Jason Owens’ Final Four: Duke over Michigan State; Texas Tech over Gonzaga; Virginia over Cincinnati; North Carolina over Kentucky.